Winging in from Detroit in 59 hours and 40 minutes over the Lincoln Highway, the first production model of the new Hupp Skylark automobile arrived in San Francisco last Monday piloted by Austin Bement, vice president of the Lincoln Highway Association and partner in the Detroit national advertising agency of Grace & Bement, Inc. In 1915, Mr. Bement, then as now a vice president of the pioneer road-stimulation organization, made the same trip with H.B. Joy, and the time was 220 hours through mud holes and over fields on the uncompleted highway. The trip was a pleasure every mile of the way and was the nearest thing to flying I have ever experienced, Mr. Bement stated. The Skylark is so low to the ground that the comfort factor is pronounced and there is absolutely no strain in driving. In fact, the car is lower than it is wide. I made no attempt to establish a speed record, because I was driving my wife on a combination business and pleasure trip, yet we ended up by approaching such official records as exist. This was indeed a tribute to the advanced engineering of the new Skylark which the association chose for its official car. The 101 horsepower Hupp engine floated us through at very high speeds, our average being 46.26 miles per hour for the entire distance. Despite this high average of speed, gasoline consumption was fifteen miles to the gallon. The Hupp Skylark driven by Mr. Bement was delivered to H.O. Harrison, veteran California motor car dealer, who will handle the line in Northern California and Nevada. 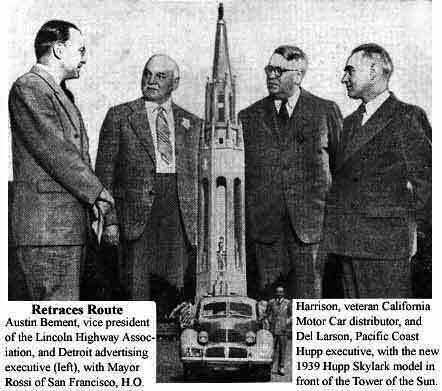 Del Larson, Pacific Coast Hupmobile factory man, was among the many greeters, including Mayor Rossi and W.P. Day, director of works at the Golden Gate International Exposition, where the journey was completed. Integral construction is a feature of the new Hupp Skylark, it was learned at the public display of the official car. The body and frame are integral and the chassis is frameless. This construction permits the extreme rakishness of design, which is an eye-catcher on city streets. Return to the Museum's Treasure Island Exhibit.